Contrarian investors should sit up and take notice as we are finally getting a definitive extreme reading from the weekly AAII sentiment survey. According to the survey, the majority of retail US investors believe that the stock market will be higher 6 months from now: 51.2% were bullish and only 21.6% were bearish. As I mentioned yesterday, this is the first time we are seeing such a larger bullish camp since May 2008 (53%) - this was one of the intermediate peak retracements during the recent bear market. The S&P 500 topped out at 1426 and fell 15% by mid-July 2008. 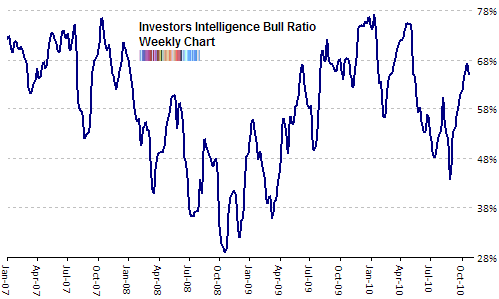 As well, the bull ratio is now slightly above 70% - something we hadn’t seen for almost 3 years. 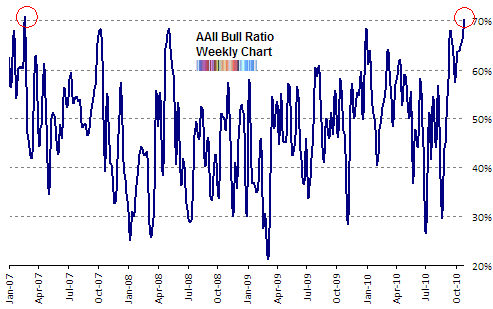 That is to say, relative to bears, the AAII didn’t have such a large portion of bulls since February 22nd, 2007. This was just before the S&P 500 corrected 6%, falling from 1459 to 1374. This week’s survey result is the lowest number of bears since mid-January 2006 (19%). In response the S&P 500 was able to trundle along for a few months basically moving sideways but it peaked in May 2006 about 2% above the January bullish extreme date. From there it declined for the rest of the summer. The result was that basically the first 8 months of 2006 were a wash.
Of course, during strong bull markets it can go much higher but in recent years we’ve seen a range for the bull ratio between 30-70% so this is definitely pushing the upper boundaries. As the examples above illustrate, historically when the AAII survey has been this lopsided towards the bullish camp the equity markets have had a tough time. According to Bespoke, from 1990 onwards, when the bullish levels has been between 50-60% as it is now, the S&P 500 index has returned an average of -0.19% in the following month (49.61% were positive). Put another way, we are now seeing less than twice as many bulls as bears. 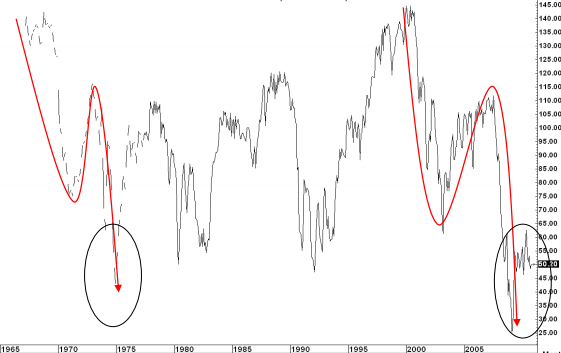 During recent market history, tops have coincided with approximately three times as many bulls as bears. Active money managers in the NAAIM survey reduced their portfolio’s long exposure this week. The average fell to 57.7% from 72% and the median ticked down to 75% from 80%. The market’s plateauing at the 1180 level on the S&P 500 index apparently is enough to warrant a bit of caution. On the other hand, the dispersion of responses was quite high suggesting that there is little consensus among money managers. 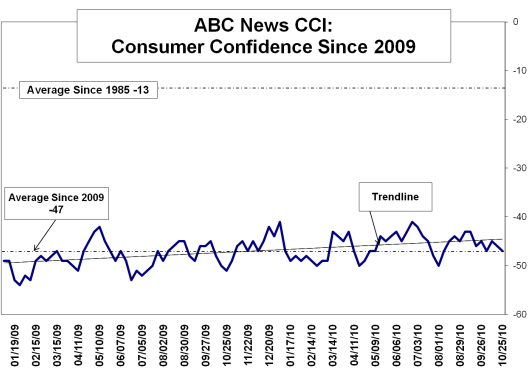 Various measures of confidence paint a picture of the average US consumer mired in pessimism, even as the economy has stabilized. The frustrations are understandable as unemployment remains high. The Reuters/University of Michigan survey of consumer confidence (preliminary) fell to 67.9 from 68.2 in September. This is far from June’s 76 but we are back once again to levels last seen in late 2009. According to TrimTabs, for the week ended this Tuesday (October 19 - October 26) retail mutual fund investors added $759 to domestic equity funds. The sum is small but what is more notable is that this is the first time since April 2010 that US investors had added, rather than withdrawn from US equity mutual funds. Knowing just how horrible retail investors are at timing the market, this should make every bull think thrice. According to the latest data from ICI, US mutual fund investors withdrew $202 million from domestic equity funds. That is a preliminary number subject to revision. Foreign equity funds continued to receive favor this week with an additional $2.2 billion - the seventh consecutive inflow. While this may be the first signs that retail investors are not fleeing equities, they are continuing to pour money as usual into fixed income. So far this month both taxable and municipal bond funds have gained an additional $20 billion. Lipper FMI’s data also suggests that investors are adding money to equities. For the week ending October 27th Lipper FMI reports a net inflow of $780 for domestic equity funds and an inflow of $1.237 billion for global markets (with the majority going to emerging markets - $999 million). Equity funds also received an additional $3.3 billion via ETFs. The option market is a bit of a conundrum at the moment - at least for me. That’s because both the ’smart money’ and the ‘dumb money’ are doing the same thing, buying calls. 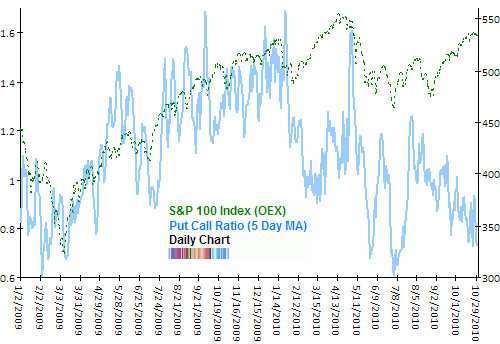 The ISE Sentiment index which measures the retail option trader activity was very bullish this week. Even though the market went nowhere fast, for 3 days the ISE sentiment index was above 200. So it seems that the retail option traders want to really push the market higher. The average ISE index (equity only) for this week is 197 and the 10 day average is 191. But things are actually a bit calmer than they were two weeks ago. This whole QE2.0 trade is getting a bit out of hand now. Everyone is getting sucked in. You have shown a perfect explain of both smart money and dumb money being long in the same time. It looks like Money Printer Bernanke has distorted every ones common sense. Barton Biggs is a perfect example of this, where he stated that he expects the stock market to rally another 10% after the Fed meeting. I’m pretty sure so do the 51% of the retail investors according to the AAII. So even though he states that a “surprise rally” would occur (his own quote), it is hardly a surprise when we look at the recent sentiment readings. “Buy the rumor, sell the news” is a little to easy when it comes to the QE2 announcement. Too obvious, IMHO. Rather, I suspect the market will break up out of its current 7 day consolidation on the QE2 announcement. I then think we will see a top around Nov. 10-15 - after more retail investors have put their money back into the market, and after many who were short into the announcement have covered their shorts. Speaking of sentiment, Barron’s Big Money Poll came out this weekend as well. It was quite interesting to see what investors thought about stocks, bonds, us dollar, crude, gold, economy, politics etc. Thanks for that link Tiho. Do you have any historical data on how well that Barron’s poll correlates to future returns? Basically I’m wondering whether it is a contrarian indicator or not (based on the blog, it sounds like it probably is, but data is always good). Not a problem mustbepatient. By the way, are you patient? As for the Barron’s poll historical data, I know Marc Faber has used it from time to time in his newsletter. 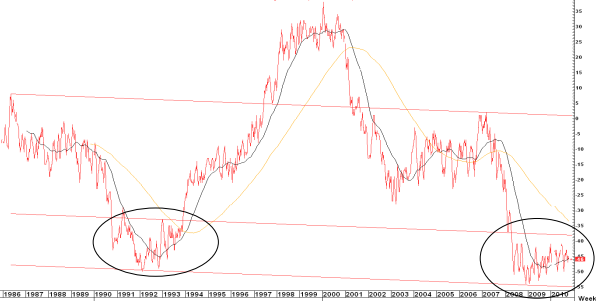 One recent example is in April 2010 newsletter where he recommends buying Treasuries as a contrarian trade. Another well followed economist, David Rosenberg, uses it in his newsletter as a contrarian indicator as well. mustbepatient, the Barron’s Big Money poll isn’t really a useful indicator. For more details, please see today’s sentiment addendum. Barton Biggs is my favorite tell. So I wouldn’t be surprised Barton has already fully committed to long side already, wanting to be the johnny on the spot for the QE2 pop. best of luck, Bart! Isn’t a low put/call ratio exactly the sign of tops? (everyone buying calls / being bullish). I think you have it wrong in the text. IZ, that would be true for the ‘regular’ put/call ratio such as the equity only or the index or total. But when it comes to the OEX, it is considered the playground of the smart money option trader so it is no longer interpreted through a contrarian lens. I can’t see why no one can see the fallacy of what is going on here. This whole ralley from 2009 onward has been a complete and total bear market ralley. If this isn’t obvious in itself let me ask you have you ever seen a recession behave like this, becasue in my life time I have seen about five or six of them including the early 70’s extremes and none of them have ever acted like this. People, when QE is the name of the game it means desperate measures ok. It means that the FED is grasping at straws and that it is desperate. This doesn’t happen in a healthy economy. Even in bull markets how many 10% rallies do you get in short periods of time or is this something new too? The way people are speaking and acting it is like a forgone conclusion that the markets are going to ralley higher and higher and that there is no downside risk at all. If the FED could actually control this outcome that so many think, we would never have bear markets at all would we and everyone would make money all the time because the FED would never allow a major contraction in the economy if for no other reason than to protect the political interests of presidents and congress. Go ahead and back the truck up and buy. However I think you will regret it. I would not touch this market with a ten foot pole as this is a suckers ralley that is going to catch a lot of people flat footed. It is too easy a trade and too easy to manipulate the market right now by HFT and bank traders with the low volume. I might also add that every day more and more emails come across my desk signaling the benefits of front running the FED. Think the herd is just maybe being set up???? Good luck.